The 1st of May saw us break free of the restraining ropes that were holding us and after 41 days of not being able to go out geocaching we eventually turned on our GPS. That might sound a bit dramatic but I can honestly say that the withdrawal symptoms we were suffering from were very real. My non-geocaching friends will think I have lost the plot here but I’ve even got itchy fingers from not Twittering, or is it Tweeting!! Apologies to my blogger friends; I have a lot of catching up to do with reading the various blogs and comments which have been posted over the past few weeks. 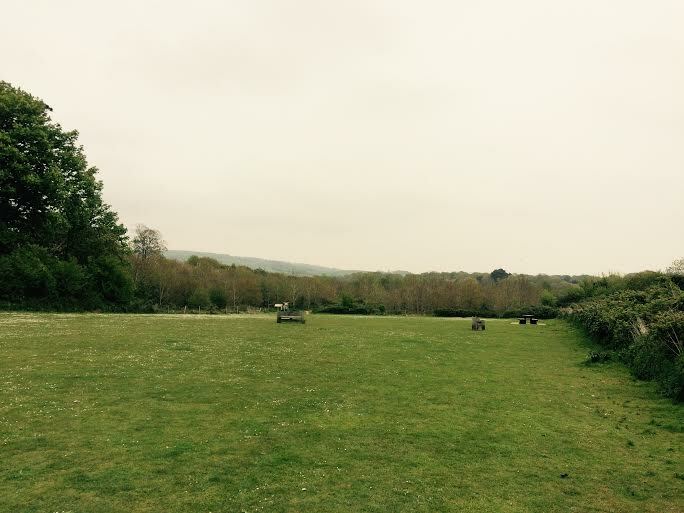 We found a few caches on the 1st May but the one which stands out was a DNF (Did Not Find). In hindsight, how pleased we were that we started looking for this one on the spur of the moment without reading the previous logs as we may not have tried to find it. 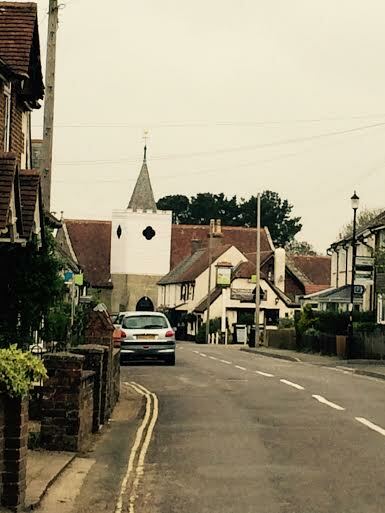 Sitting in a little village on the Isle of Wight – Newchurch; or to be more precise enjoying a coffee at The Pointer Inn on a rather grey day, we noticed that there was a cache about 1k away starting from the car park just up the road. Being a Geocacher has its advantages – a brilliantly interesting hobby; it keeps the old grey matter active; you get plenty of exercise by walking, climbing, slipping, sliding and stumbling along exciting trails and finding places you never knew existed and at the end of it all you hopefully find a little treasure trove, or at the very least a log book to sign. The disadvantage is that it’s addictive – whenever you sit down for a relaxing coffee somewhere pleasant the phone comes out and the Geomap clicks on and your mind is already plotting which of the local caches you could fit into the time you have got left. Have you finished your coffee yet Cockrobbinn???? Newchurch is a beautiful little village where we had already found two other caches so after leaving our car in the FREE car park we headed off in the direction of Newchurch Dash. Not sure why it is called a ‘Dash’ as it is definitely not a quick park and dash (or grab) but it is one of the most beautiful walks we have done and we couldn’t have chosen a better time of year to do it. Heading out of the car park we came across the village recreation field which was a mass of white daisies (unfortunately the photo doesn’t show them up). Such a quiet spot with no-one in sight and benches and picnic tables ready for the warmer weather. 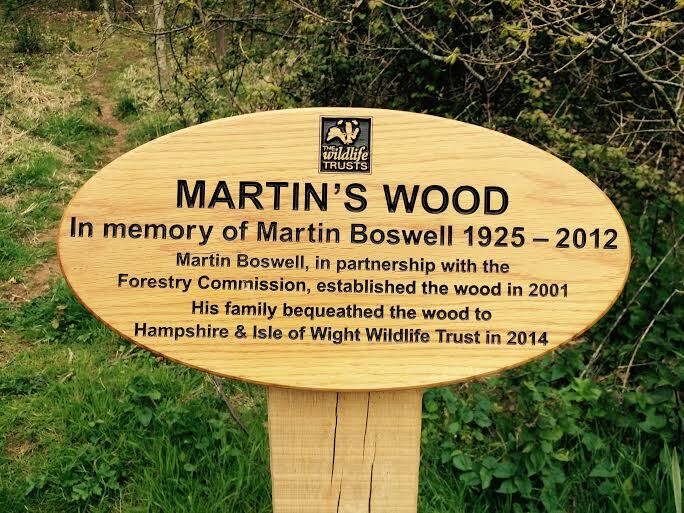 We walked diagonally across the field and soon came to the entrance to Martin’s Wood which is an amazing new wood, slowly being established. The historic village of Newchurch stands on high ground and is surrounded by an open, flat, farmed landscape made up of sandy soils. Martin’s Wood is a species-rich area which is situated on a sandy hill with free-draining soil into the marshes to the south. The area used to be an old sweetcorn field which has now been set aside for wildlife. Martin’s Wood is a new woodland linking the ancient woodland of Lynch Copse with the ancient heath pasture of Hill Heath. This has helped species such as red squirrel and dormouse to thrive, but something else quite remarkable has happened – the dry spaces left open in the new woodland have slowly colonised with an array of plants to make a habitat somewhere between a dune and heathland. 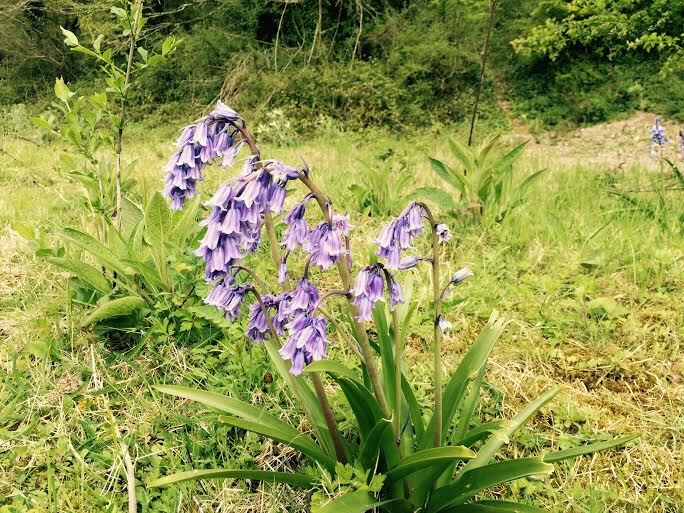 Local wildlife organisations have worked with the landowner and the community of Newchurch to conserve and enhance the special habitats that have developed in these old fields. Bees have found this habitat irresistible; feeding on the pollen and nectar here, and also nesting in the sandy ground. There are some 96 species of bee and wasp of which 23 are nationally rare and three are completely new to the Island! The Bee Fields, part of Martin’s Wood, are literally buzzing with life – thankfully these aren’t stinging bees, they are mostly tiny mining bees that burrow into the sandy soil. 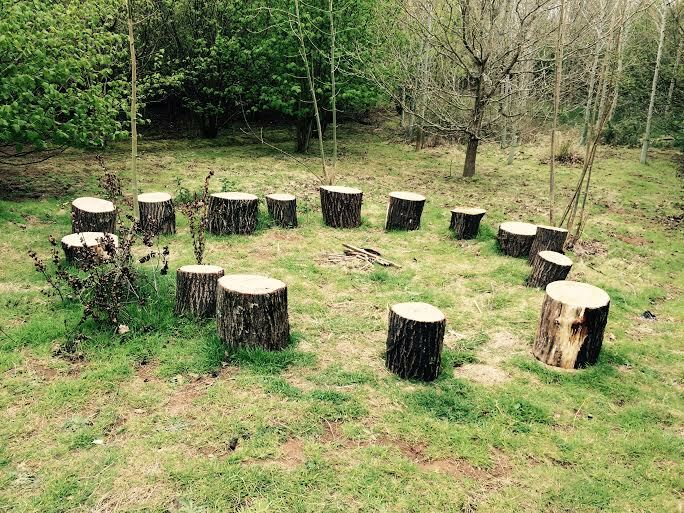 Fairy ring or tree ring? We couldn’t have picked a better time of year to have walked these woods and without Geocaching, would never have found the place. The paths were lined with wood-anenome, bluebells, primroses and little white flowers the name of which I have no idea. The trees were just breaking into leaf; there was buzzing, bird song and rustling in the undergrowth and all the time we could hear a woodpecker tapping away. It was so idyllic that at times we forgot we were slowly heading towards Ground Zero. 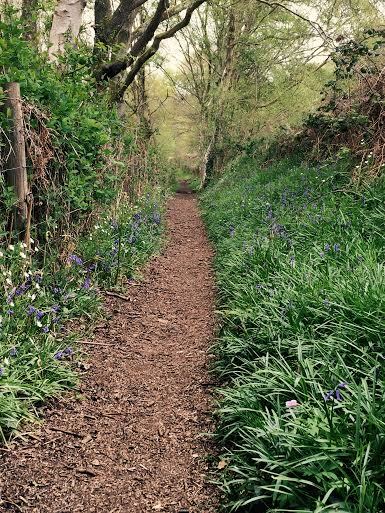 The paths were perfectly dry and a pleasure to walk along – a bit different from many we had been along recently. As we grew closer to GZ we realized that we were approaching part of the wood where major clearance had been taking place. Huge tracks in the soil indicated that massive machinery had not long passed by and as we approached our destination we could see pile upon pile of brush heaped up. We found the tree with three trunks (clue) but the felled trunk was completely hidden underneath a massive pile of brush. We poked around for a while but knew there was little chance of finding the cache; the felled tree was completely rotten and disintegrating underneath the weight of the brush. Reading the previous logs, others had the same experience. We actually weren’t very disappointed as the walk had been so beautiful and little did we know, we were to see a lovely sight on the way back to the car. On the way to GZ we had glimpsed some daffodils through the newly planted trees so we made a detour to find them and came across this Field of Hope. Again, the photograph just does not do justice to the beautiful view. This is the Marie Curie Cancer Care Field of Hope supported by the Isle of Wight County Press, Newchurch Primary School and Island 2000. It was so peaceful here that we lingered awhile before making our way back to the car. We will be keeping our eye on this cache and hopefully the CO will replace it in due course. This woodland will be well worth another visit in a year or two when many of the newly planted trees are more established. 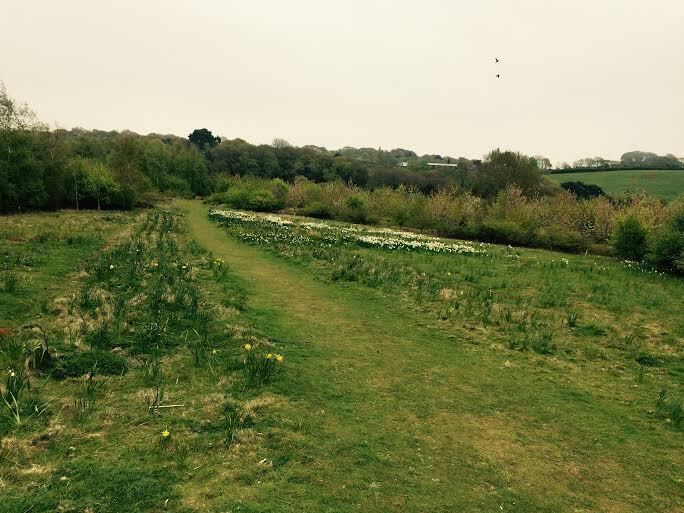 This entry was posted in Caching, Geocaching, Hobby, iPhone, Isle of Wight, Nature Reserve, Newchurch and tagged Caching, Geocaching, Hobby, Isle of Wight, Martin's Wood, Newchurch. Bookmark the permalink. 2 Responses to The Best Ever DNF ! It really was Paul; almost magical.